Somewhere a debate will be happening between earnest philosophers. 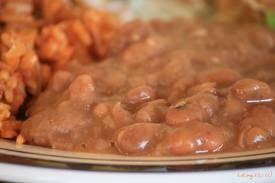 Do refried beans constitute authentic food? They are part of traditional meals in Mexican cuisine and fundamental to a working class diet but dammit they are also beans refried. The argument could last forever. 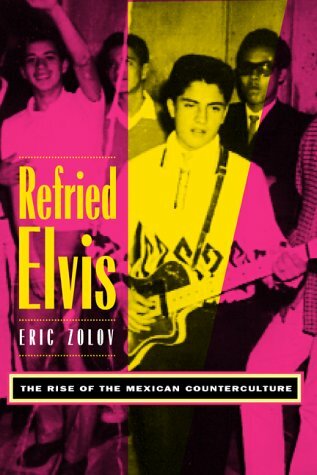 Zolov in his book ‘Refried Elvis.’ It fascinates because not only does it explain what happened in Mexico but because the inevitable differences illuminate how and why rock music developed the way it did in the States and in the UK. Two surprises are revealed by the book. First, rocanrol began in Mexico as a middle class phenomenon. The working class who could not afford either American records or the Mexican covers initially stayed loyal to traditional Mexican music. The new music was popular but it took time to spread out from the city. This was an urban phenomenon. Second, rock and roll was not immediately condemned by the establishment and parents. If there were doubts about the appearance of Elvis, his music was encouraged as a token of a new world modernity that Mexican society needed to embrace. The approval of the establishment did not last because soon rocanrol was to be used as a means of rebellion against parents, rebeldismo. rocanrol began as mainly a middle class phenomenon elements of class conflict also contributed to the violence in the cinema. In a separate incident, Elvis was accused of making disparaging remarks about Mexican women. This is dismissed by Zolov as unfounded and he even identifies the culprit who invented the rumour. But with the sneer of Elvis now much more threatening and their children suddenly more remote and irritatingly knowing, the Mexican establishment became uneasy. Unlike in America and Europe, rock and roll became subject to censorship laws. These laws emphasised the need for music in the Spanish language but there was little in fifties rock and roll that did not survive censorship. Rocanrol, which was admittedly now home grown, flourished during censorship. Eventually, rock music in Mexico followed a similar path to what happened elsewhere. The music became political and the hair grew longer. Interestingly, left wing academics in Mexico were far less indulgent of Mexican hippies than in America and Europe. They spotted quicker than their Western counterparts the lack of concern hippies had for the trials of working class life. The leftist cultural critic, Carlos Monsivais, is quoted. ‘Of what great (material) abundance can the Mexican hippies (claim to) deny? Against which high technology do they protest in the name of love?’ Carlos said this in 1968. The same doubts were valid in America and Europe if nowhere near as sharp. The much higher standard of living kept left wing critics of hippies quiet. Merle Haggard spoke instead and made the situation worse. ‘Refried Elvis’ is a book about rock music, imperialism, modernity, class and politics which means it resonates. Rocanrol was listened to in cafes called existencialismos which is definitely affected but quite endearing. The initial reaction is that the book uses Elvis in the title unfairly. This is a book about Mexico and how popular music changed because of the influence of America and because of the political and social concerns of its youth. But when you look at the list again it is apparent that for all his lack of education and supposed unsophistication Elvis was a performer whose career repeatedly made statements about the issues that concern Zolov. In a sense, the career of Elvis tells us how an uneducated man deliberately set out to forge an identity that would help him make sense of his inheritance – music, American power, the modern world, class discrimination and political advocates who denied as much as they promised. His critics will say that Elvis never really said anything other than hiccup inarticulately but anybody who listens to the music of Elvis will be aware of how he was always willing to share his loneliness and alienation. He was too big a character and symbol for that loneliness to be a simple consequence of failed romance with his female partners. There are two words on the list that are particularly important, modernity and class. Elvis was no simple modernist. There was always a link with the past. 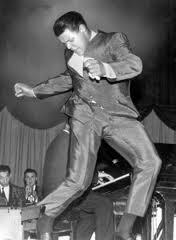 Before Elvis, popular music had progressed beyond the blues to jazz. Elvis took it back which is why arguments about him stealing from black musicians are irrelevant. He did what Little Richard claimed. He opened the floodgates for music that had been buried in working class communities. This was the contradiction that was misunderstood in Mexico. Elvis was fine when he represented modernity. When he came into conflict with the Mexican idea of modernity and inspired youths to grow their hair, chew gum, walk strange and be generally daft he was seen as a threat and criticised. Elvis became unfashionable everywhere because modernity had to triumph. defining what would happen. The difference was that in America these people arrived later. When the talented Dylan did emerge to vanquish the social class he supposedly supported he appeared on the CBS record label. Of all the record labels, CBS had in the fifties been the most reluctant to taint itself with rock and roll. When it realised it needed to sell records to the young its first faltering steps were into watered down folk music. After Dylan became successful, CBS recorded rock acts but it always pretended that it was a label interested in serious worthwhile music. These contradictions and pretensions were personified in the rather dodgy chairman of CBS, Clive Davis. The rock music he unleashed was mainly dreary. If modernity and class is important to rock and roll in Mexico and everywhere else then politics has always been required, albeit in varying dosage. Political protest has dominated Mexican music but presumably this is a consequence of the sharp social divides that exist in that country. Social conflict is likely to increase everywhere in the next decade. Perhaps music will converge again like it did in the late 60s to unite discontented young populations. We will have to wait and see. But just in case it does happen it will do no harm to be prepared. ‘Refried Elvis’ is not a bad place to start. Despite a real dislike of refried beans I really enjoyed this informative and entertaining piece. Well, now I have a new book for my reading list. Thanks, Howard! Hope you like it. Feel free to give feedback. I acknowledge all feedback.